"I am unsure of the exact origin of these engines, both have the 11 stud cooper s heads but strangely they both also have a strange oil filter mounting position (see pic) which means the block casting is completely different to any other mini I have seen ?" 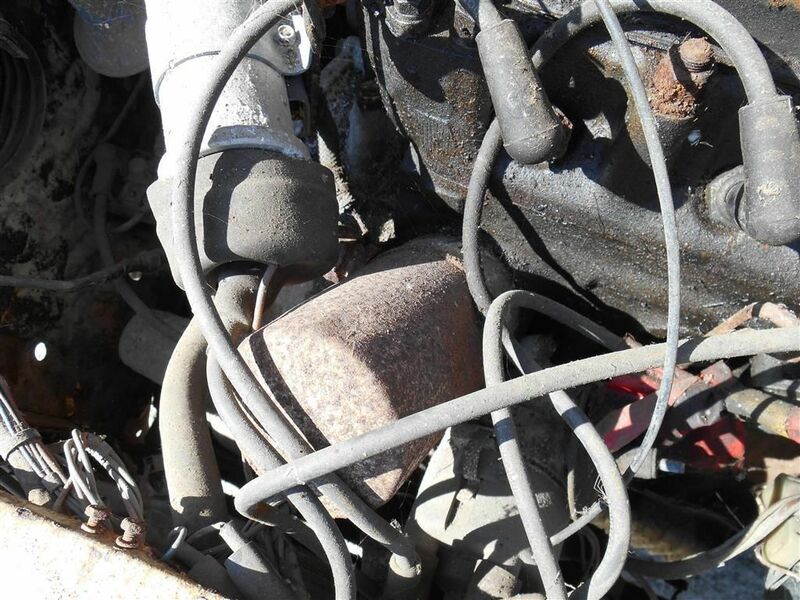 I guess below is the reason for the oil filter position on the block.....South African A-series engines fitted ! "While the Clubman story was very different in Australia, as detailed in Issues 19 and 25, the South African Clubman had its own unique history – particularly the 1275GT. Like Australia, South Africa dictated local content levels to obtain import excise rebates and greater tariff protection. However, where Australia’s local content rules were based on a percentage of production cost, South Africa’s was based on a percentage of vehicle weight." "Based on the UK 1275cc Cooper S engine block, the South African engines featured integral side covers and an internal oil filter gallery, which allowed the filter to be placed high on the block, above the starter motor. Like the Cooper S engine, the bore was 70.64mm and the stroke was 81.33mm to achieve 1275cc. 1098cc was easily achieved with a shorter-stroke crank and different pistons (and requiring a different camshaft), giving a stroke of 69.85mm – as opposed to the 68.26mm of the 1071cc Cooper S.
This allowed a great deal of interchangeability of parts which, combined with the 1275cc unit being used in the ADO16 models and a local 1300 Marina, provided a significant cost saving over using different engines. With this background, the South African Mini Clubman was released on 6 August 1971 – ten days before the Clubman was released in Australia. Unlike the Aussie Clubman, though, the Springbok version looked very much like the UK version, with concealed door hinges, full-width winding windows and no door pockets." The Marina 1300 used a similar block in an inline configuration. Latest ad includes this link to an interesting blog with photos written by Tim Ferris, a driver and mechanic for the Transworld expedition. "It started in the autumn 1979; I was a third year apprentice at the British Leyland dealers in Truro (Mumfords) and had been rallying a Mini Cooper S the Garage had agreed to prepare two mini’s for a round the world trip and I was asked to do the work. It took a couple of months, all unnecessary trim was removed a safety roll cage fitted, the body was seam welded and strengthened, rally seats and underside protection added. In early 1980 I was then asked if I would go on the trip as the mechanic, I had only recently met Mary, my now wife, and was only part way through my training. Although everyone else said I should go I wanted it to be my decision so firstly agreed to go on part of the round England publicity tour. After getting engaged to Mary and agreeing a year sabbatical from Mumfords and the college decided to was too good an opportunity to miss. As well as the garage there were several other sponsors, from Compair Holmans, Kuhne & Nagel and the BBC’s Nationwide programme, the trip was to raise awareness for a Stop Polio Campaign in Malawi to prove Polio could be eradicated if a cold chain was set up. So in April 1980 we drove the cars to London and had a big send off at the BBC with Save the Children fund and Ian Drury of Blockheads fame a Polo Suffer. To begin with it was just Tony Clarke (34) an entrepreneur from Penryn whose idea it was and the expedition leader and myself (20). In Paris we met up with our first (more about this later) cameraman Previn Thakur (now a Bollywood film producer) and then drove to Marseille to catch the ferry to Algeria. 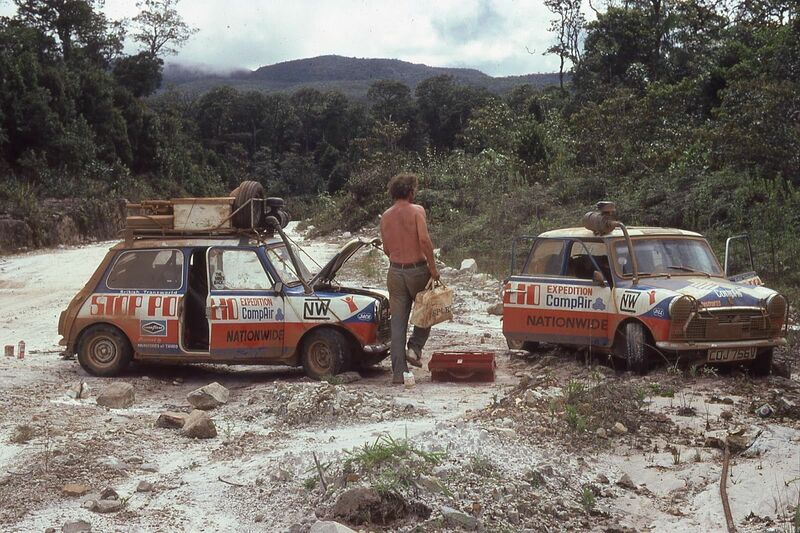 I am sure the BBC decided to support the expedition as they thought it would not be possible to take two Minis’ around the World and in fact British Leyland at the time said they would not guarantee and Land Rover could do it! So we very naively entered Africa and had our first encounter with bribes, baksheesh, backhanders whatever you like to call it. There were over 30 ships stuck in Algerian port and with the help of the British Embassy we managed to get the cars and camera equipment through customs and headed off towards the Sahara. The first 1000 miles the road was tarmac, not very good in places and only one lane wide which meant when someone came towards you moved to the left keeping one wheel on the tarmac the other in the dirt, unless they were bigger than you, which let’s face it most cars are, and you moved completely onto off the road. We bought extra water and fuel plastic tanks to carry on the roof rack of Jack to extend our range." My gosh that looks like a good job. I must have joined after this was first posted as I know Tim Ferris, indeed, his dad is a former owner of my 1071! Itching to unscrew those wheel arches though. Funny you should mention those arches, I wonder where some of them ended up!!! Is anyone on touch with the new owner(s)??? Sorry not in touch with the new owner but if the Minis are currently on display at the London Classic Car Show I guess it should not be too difficult to track them down? Maybe the show organisers would put you in touch, or at least act as a go-between initially, if you mentioned you have the original arches to be re-united with the car.